The 19-mile Perkiomen Trail runs through the Perkiomen Creek Valley from its junction with the Schuylkill River Trail at Oaks, Upper Providence Township to the largest County Park, Green Lane Park. Most of the trail is a 10-foot wide cinder or stone aggregate (non-paved) surface with grass shoulders. Selected sections are paved where deemed appropriate. 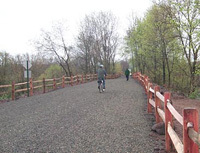 The multi-use trail follows the Perkiomen Creek and connects three County parks (Lower Perkiomen Valley Park, Central Perkiomen Valley Park, and Green Lane Park) and two County historic sites (“Mill Grove” – Audubon Wildlife Sanctuary and Pennypacker Mills). It passes directly through ten (10) municipalities making connections to numerous municipal parks and open spaces along the scenic waterway. 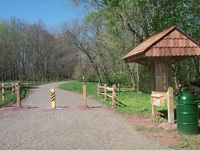 The trail provides access to Valley Forge National Historical Park via its connection to the Schuylkill River Trail extension.